Old photos of London provide views of a very different city and old postcards provide a wide range of photos of the city, and often a very brief insight into the lives of the many millions of people who have passed through the city. For this week’s post, here are a selection of old photos of London found on some of the postcards I have come across over the years. To start, here are some views from above the streets of London. 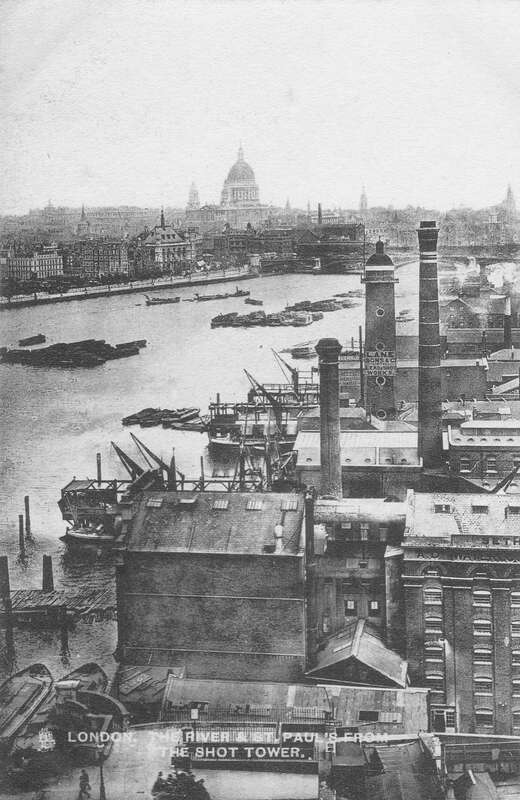 This first postcard provides a rather unusual view as it was taken from the top of the Shot Tower which once stood on the Southbank. The view is looking towards the City and shows the industrial nature of the south bank of the river. The photo was taken from the top of the Shot Tower which survived the demolition of the area in preparation for the Festival of Britain, along with the general post war reduction of industrial sites along the south bank. The use of the Shot Tower as a feature during the Festival of Britain is probably the main reason why it is known as “the” Shot Tower however look at the photo and there is another tower that looks like a lighthouse, with circular windows running up the tower and a dome-shaped roof at the top. This was another Shot Tower owned by Lane Sons & Co, Lead and Shot Works. The towers were used for the production of shot balls by dropping molten lead from the top of the tower which would form into circular lead shot during the fall. As well as the industrial buildings along the south bank, the photo shows the multiple landing stages into the river. The scene is so very different today with the space along the river now being occupied by the river walkway, the National Theatre, IBM offices and the office tower and studios of the London Television Centre. 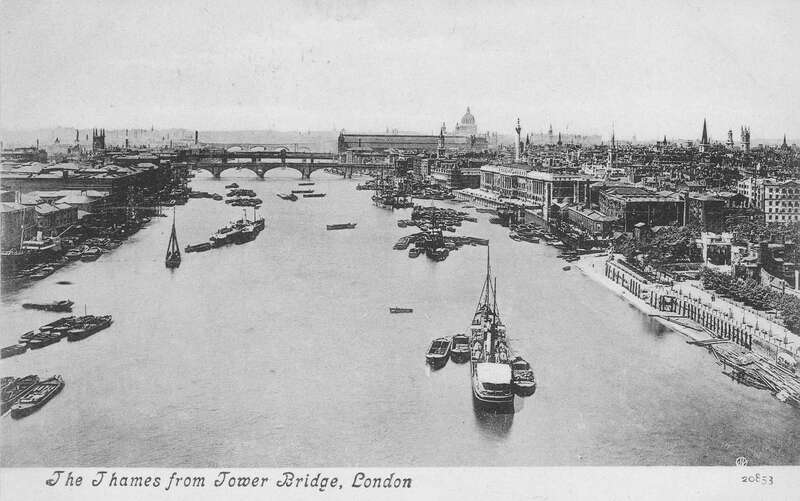 The next postcard is a photo of the river taken from the top of Tower Bridge, looking towards the west and London Bridge. The view shows a low-rise City with the Monument, St. Paul’s Cathedral and the steeples of the City churches still standing well above their surroundings. On the south bank of the river is the tower of Southwark Cathedral, and past that we can just see the towers and chimneys that feature in the previous postcard. 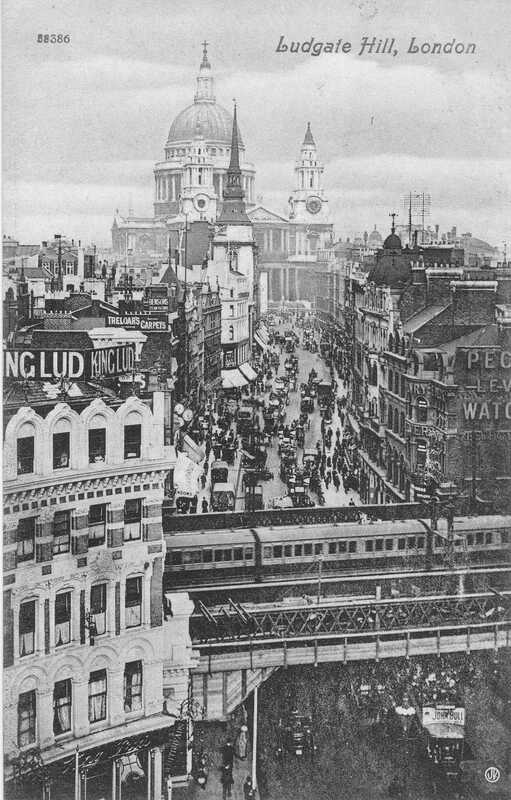 The view in the following postcard is looking down on Ludgate Hill, leading up to St. Paul’s Cathedral. The bridge is carrying the railway along to Holborn Viaduct station, and the building to the left of the bridge is the King Lud pub. The King Lud finally closed in 2005, I took a photo of the pub in 1981 whilst walking the route on the evening before a royal wedding. 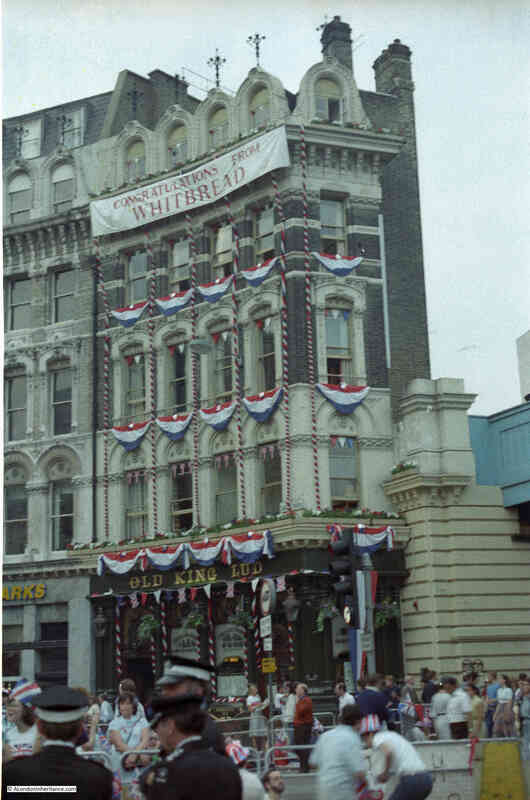 It was a shame to lose this lovely Victorian pub. Photos of Westminster Abbey are usually from ground level so it is difficult to appreciate the scale and full architecture of the building. This view is from the south and I have been trying to work out from where the photo was taken, which I suspect was from the top of the church of St. John’s Smith Square, and this view does fully demonstrate the overall size of the building. 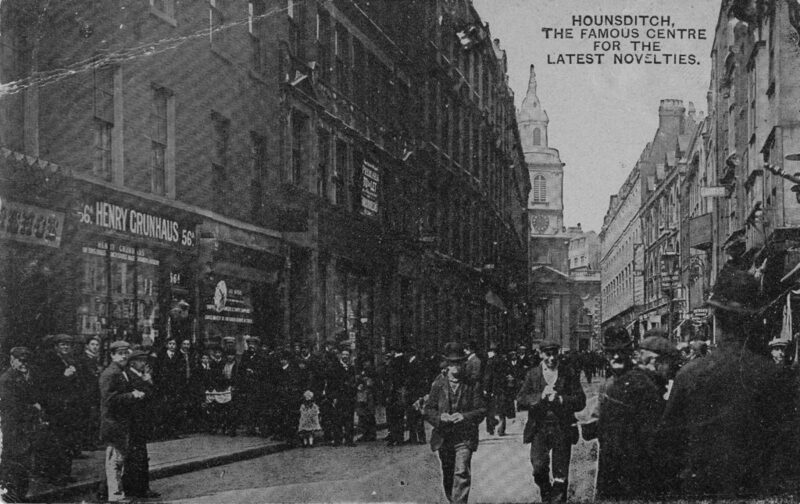 Old photos of London also frequently featured street scenes across the city. 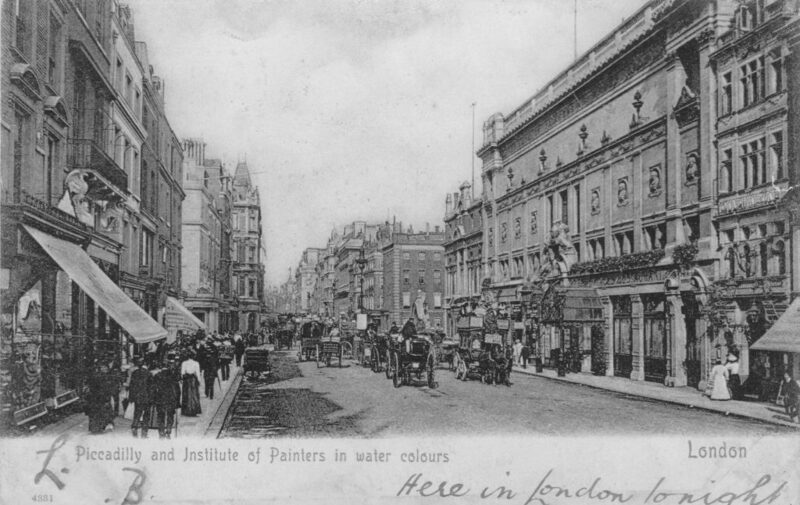 The photo on the following postcard was taken at the junction of New Oxford Street (the road running into the distance on the right of the photo), Charing Cross Road on the right and Tottenham Court Road on the left. What I find interesting is that the photo includes the large brewery that occupied the space where the Dominion Theatre now stands. This was the Horse Shoe Brewery. The brewery opened around 1764 and gradually expanded to occupy a large site as one of London’s largest breweries. The brewery was taken over by Henry Meux in 1809 and five years later the brewery was the scene of one of London’s more unusual disasters – the great beer flood. “The neighbourhood of St. Giles was on Monday night thrown into the utmost consternation and delay, by one of the most melancholy accidents we ever remember. About six o’clock, one of the vats in the extensive premises of Messrs. Henry Meux and Co, in Banbury-street, St. Giles’s, burst, and in a moments time New-street, George-street, and several others in the vicinity were deluged with the contents, amounting to 3,500 barrels of strong beer. The fluid, in its course, swept every thing before it. Two houses in New-street, adjoining the brew house, were totally demolished. the inhabitants, who were of the poorer class, were all at home. In one of them they were waking a child that died on Sunday morning. In the first floor, in the same house, a mother and daughter were at tea – the mother was killed on the spot. The daughter was swept away by the current through a partition, and dashed to pieces. The back parts of the houses of Mr. Goodwin, poulterer, of Mr. Hawse, Tavistock Arms and several others in Great Russell-street, were entirely destroyed. A little girl, about ten years of age, was suffocated in the Tavistock Arms. About six o’clock, three of Mr Meux’s men employed in the brewery, were rescued with great difficulty, by the people collected to afford relief, who had to wade up to their middle through the beer. To those who even approached the scene of ruin, the fumes of the beer were very offensive and overcoming. It is therefore presumed that many have perished by suffocation. No time was lost to set about clearing the rubbish. Great numbers of men have been incessantly employed in this work. The disaster did not seem to harm the Meux brewing company as there were no financial penalties on the company and they were also able to reclaim the tax paid on the lost beer. 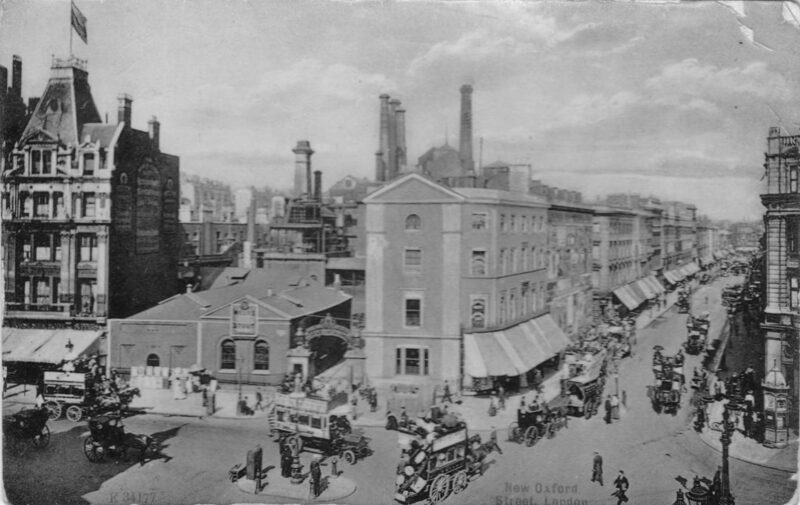 The brewery continued in production until closure in 1921 as there was no available space for expansion and savings could be achieved by consolidation of the multiple breweries that operated across London at the start of the century. As with the view from the Shot Tower, the photo of the Meux Brewery shows how much industry there was in central London in the early years of the 20th century. 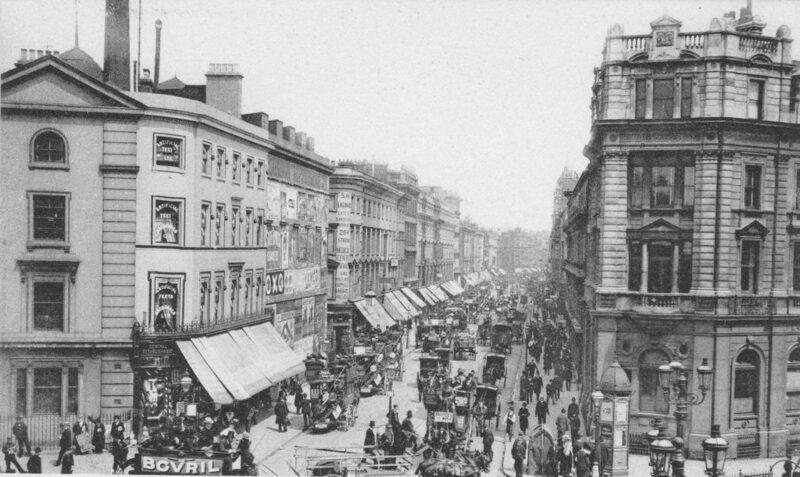 The next postcard is also of New Oxford Street, but is looking down the full length of the street. Awnings are over the shop frounts along the entire north side of the street as these shop windows were facing south, and would therefore get the full impact of the sun. 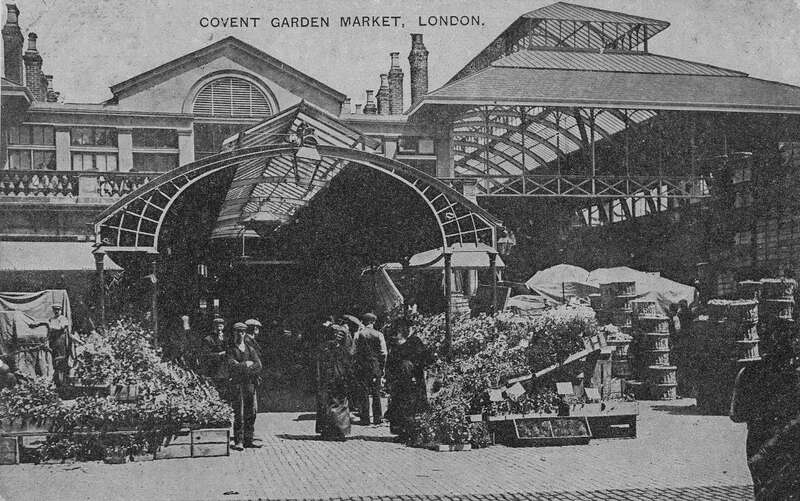 The sender of the following postcard of Covent Garden Market was also on a trip to London and staying in Harold Road, Upton Park. It was sent on the 10th October 1907 to an address in Gorleston on Sea in Norfolk. Both the houses still exist. London Bridge was a regular subject for postcards of London, however the majority were from the early decades of the century, or later colour photos. A view across the bridge in the 1950s was an unusual find (the postmark dates the sending of the card to 1956). 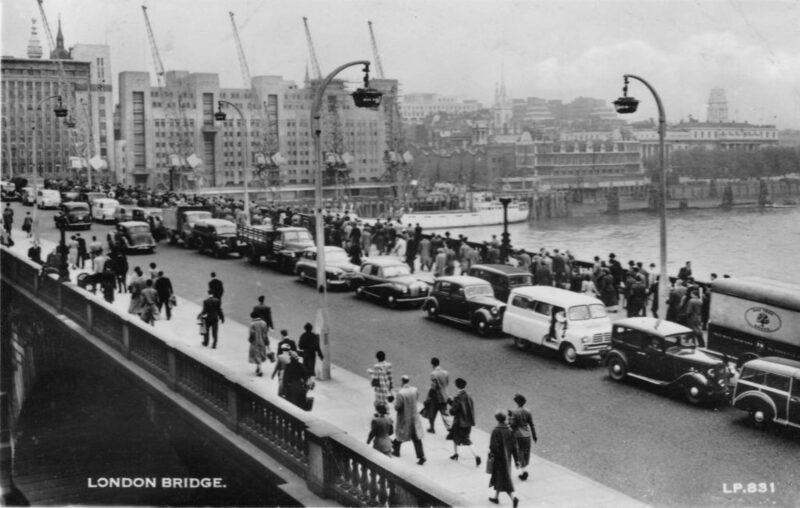 London Bridge has always been a busy walking route from London Bridge Station across the river to the City, and in this photo there is also a long queue of 1950s vehicles in the opposite direction. The five cranes on the opposite side of the river are alongside New Fresh Wharf, a busy wharf that handled very large volumes of general goods, fruit and canned goods as well as operating as a terminal for passenger ferries. The buildings were demolished in 1973. Houndsditch (note the spelling mistake on the postcard) was known for many years as the part of London where there were shops piled high with cheap clothing, novelties etc. 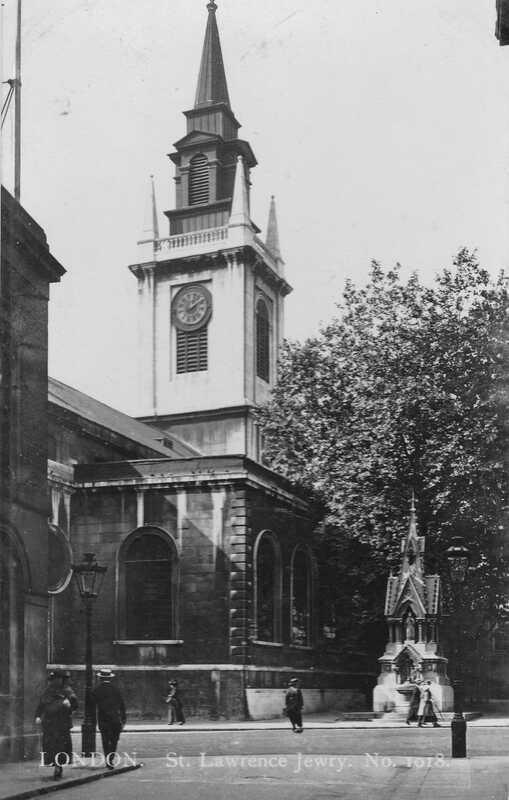 The church at the end of the street is St. Botolph Without Bishopsgate and the photo was taken roughly at the junction with Stoney Lane. Whilst all the buildings have changed and the street is now lined with recent office buildings, the alignment of the street and view to the church is much the same. I bought my first proper camera, a Canon AE-1 in a long gone camera shop in Houndsditch in 1978. Old photos of London also show objects in the view which would not be expected from looking at the scene today. The following postcard, sent in 1912 shows the Queen’s House in the background and the entrance to the Royal Hospital School. The photo was taken from the Romney Road in Greenwich, and shows what appears to be a fully operational sailing ship some distance from the river. 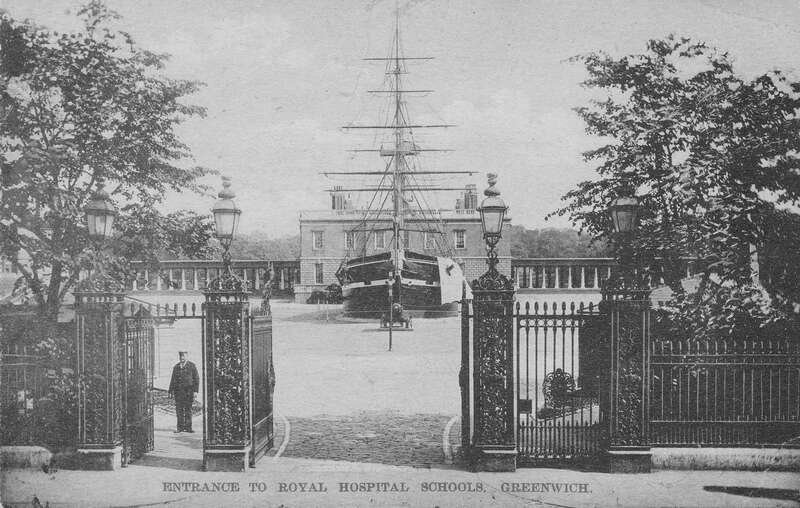 The ship is a purpose built training / drill ship that was built for the boys of the Greenwich Hospital School. There were three variations of the ship with the first being built in 1843 and the final ship, named Fame, (seen in the photo) built between 1872 and 1873 and demolished in 1933. 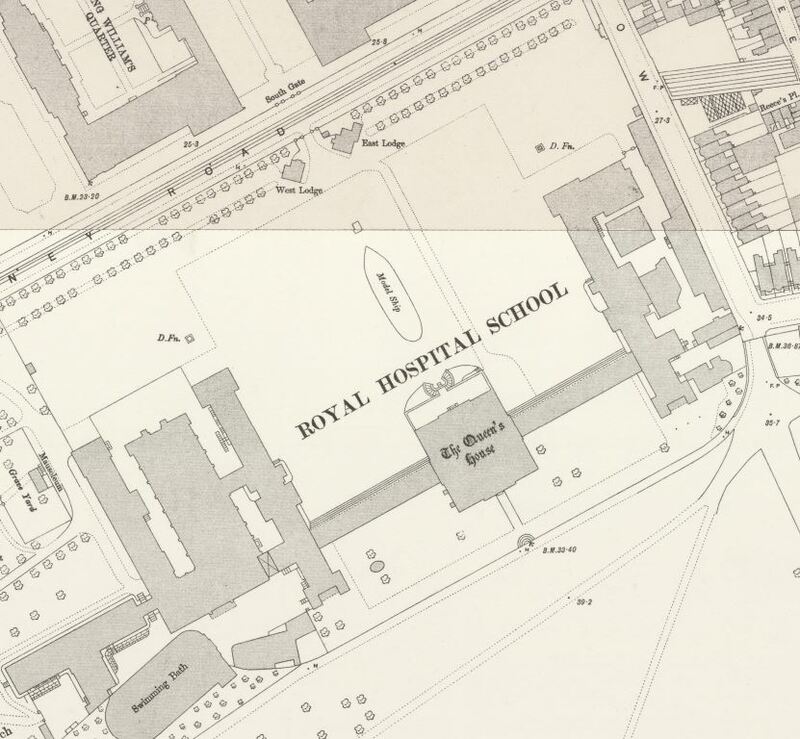 The ship even made it onto the 1895 Ordnance Survey map where it is shown as a “model ship”. It may have been a model, but it does look rather impressive in the above photo. The next photo is of the church of St. Clement Danes in the Strand. 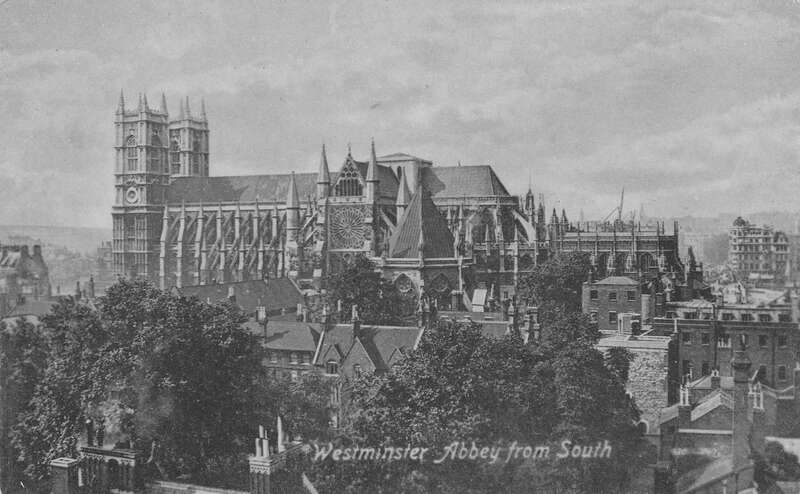 To produce this postcard, the sky has been coloured while the rest of the photo is in black and white – an early attempt at producing more realistic views. What interested me in this photo is not the church, but the street light in the centre of the photo. This is an example of an electric arc light, the first type of electric street lighting. These were fed by DC current and whilst the lighting column design was different across London, the design of the glass bulb where the arc was produced at the end of the metal fitting was the same. 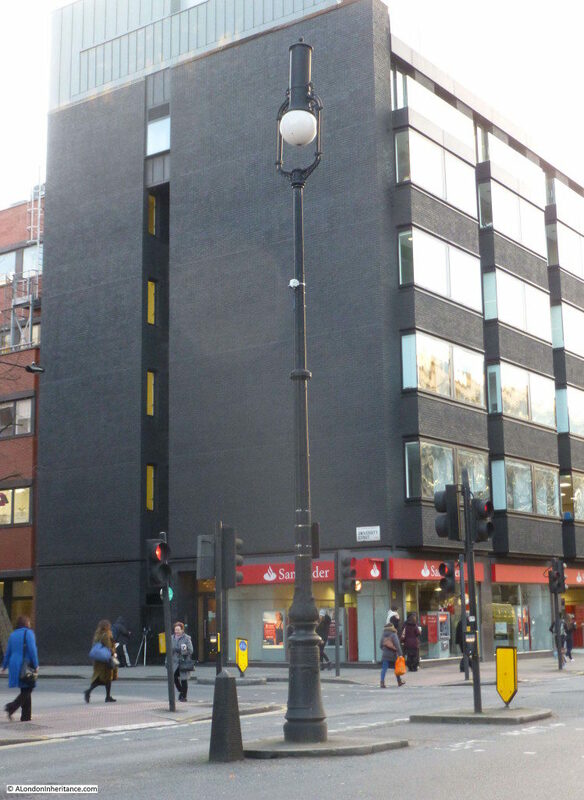 The original lamp posts can still be found on Tottenham Court Road as shown in the photo below (see my post about the Regent’s Park Power Station And The First Electric Lighting In Tottenham Court Road). The following postcard has the title “Old Roman Bastion in Cripplegate Churchyard”. 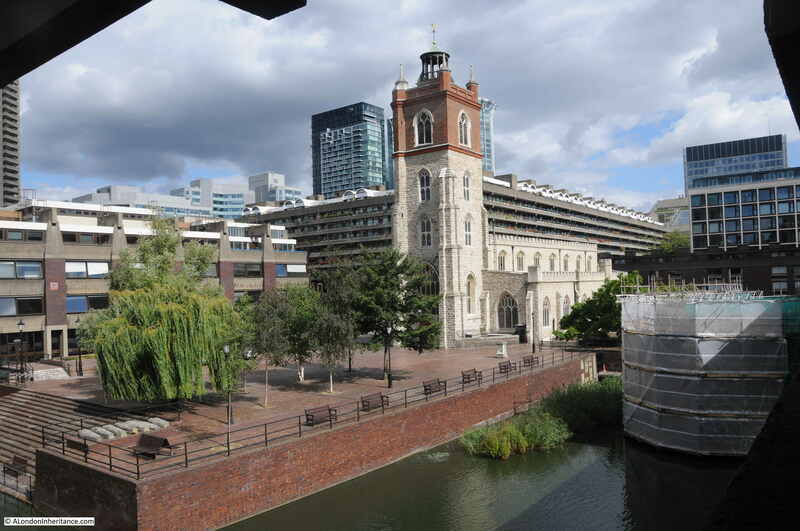 The whole area around the bastion was heavily damaged during the blitz, and the bastion now sits within the Barbican complex. 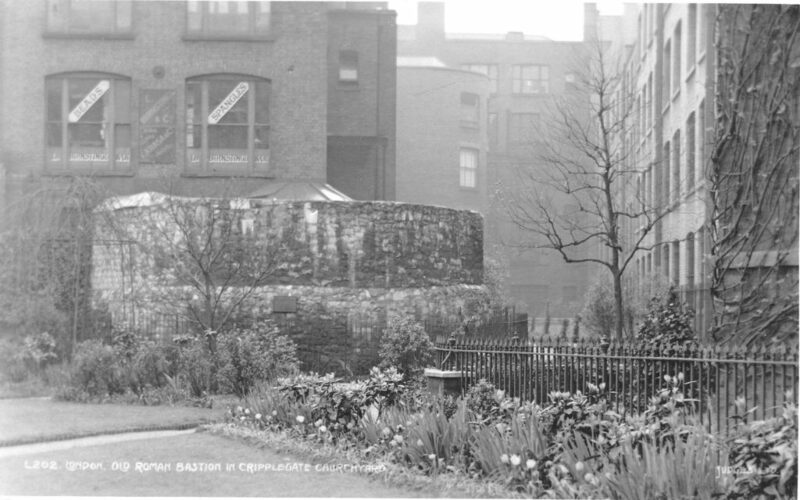 I was hunting for my photos of the bastion today, however the only one I found was the following which shows the bastion on the right, covered in sheeting, however it does illustrate the new surroundings for the bastion compared to the above photo, however this is only one change in the many changes the bastion has seen over the centuries and will no doubt see many more changes. 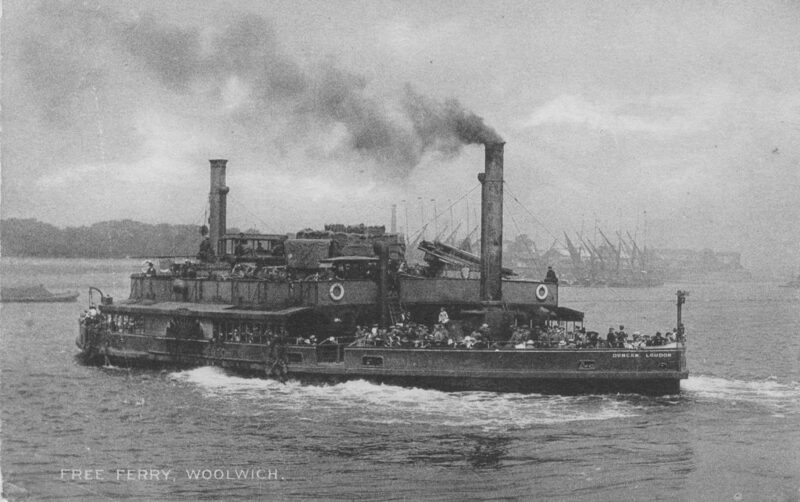 The following postcard shows the paddle steam Duncan, one of three such steamers that formed the Woolwich ferry at the end of the 19th century. The Duncan was built in 1889 and was not replaced until the 1920s. The lower deck appears to be full of people, including many in military uniform whilst the upper deck appears to have vehicles and cargo. 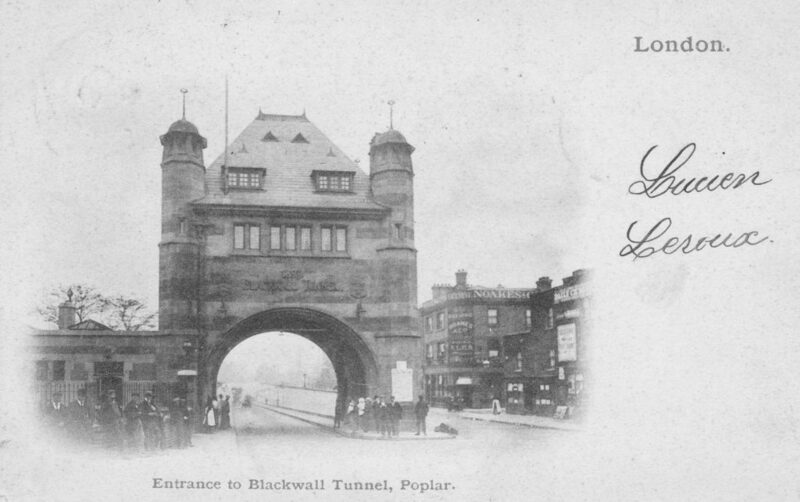 An alternative method of crossing the River Thames was by going underneath and the following postcard shows the Poplar entrance to the Blackwall Tunnel. The card was posted in 1904, so just seven years after the tunnel was opened in 1897, probably why a photo of the entrance was deemed worthy of being on a postcard. The postcard was sent to an address in Belgium so I am not sure what the recipient thought of receiving a postcard of the entrance to a River Thames tunnel. London has seen many celebrations over the centuries and since the start of photography, many of these have been shown on postcards ready to send around the world. The following two postcards show one of the remarkable constructions built to celebrate the coronation of King Edward VII in 1902. 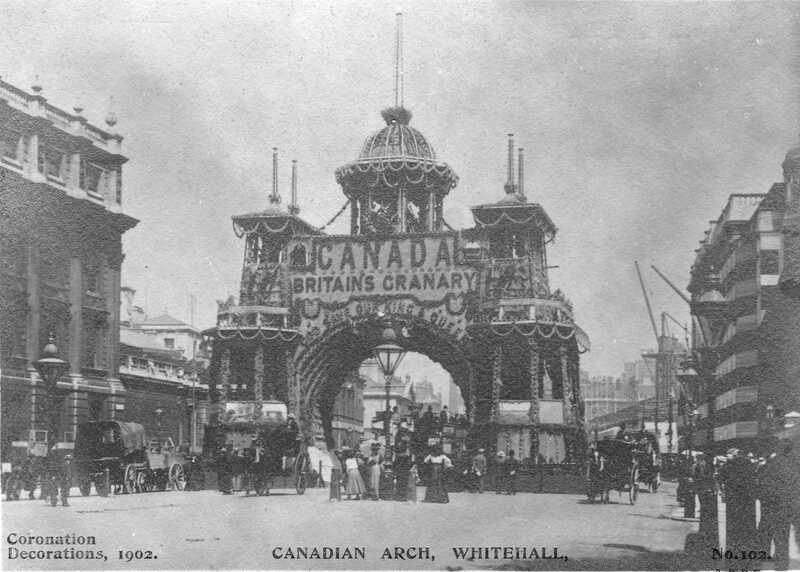 This is the Canadian Coronation Arch in Whitehall on the ceremonial route from Buckingham Palace to Westminster Abbey. 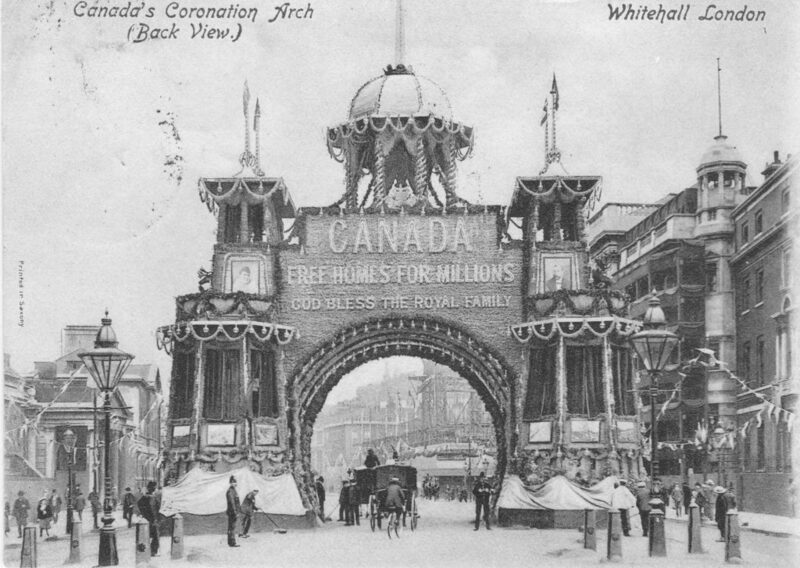 The purpose of the arch was to advertise Canada to the British population. It was decorated with the products of Canada (woods, grains and fruits as well as the maple leaf as the national symbol of Canada). One side of the arch advertised Canada as Britain’s Granary whilst the other side advertised Free Homes For Millions to advertise the attraction of Canada as the home for British immigrants. The postcard was posted in 1902 to a Miss Schofield in Dorset with the only written comment “Hope you have not this one”. The arch was also lit up at night and covering the width of Whitehall as well as being at the same height as the surrounding buildings must have been an impressive sight. Another London celebration just a few years later was the Centenary of the Battle of Trafalgar on the 21st October 1905. 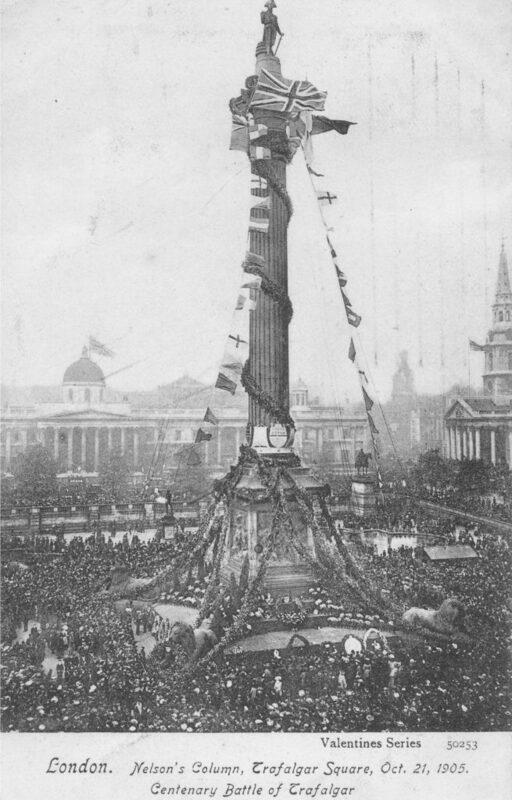 Trafalgar Square and Nelson’s Column were the centre for the centenary celebrations and the column was covered in some rather impressive decoration. 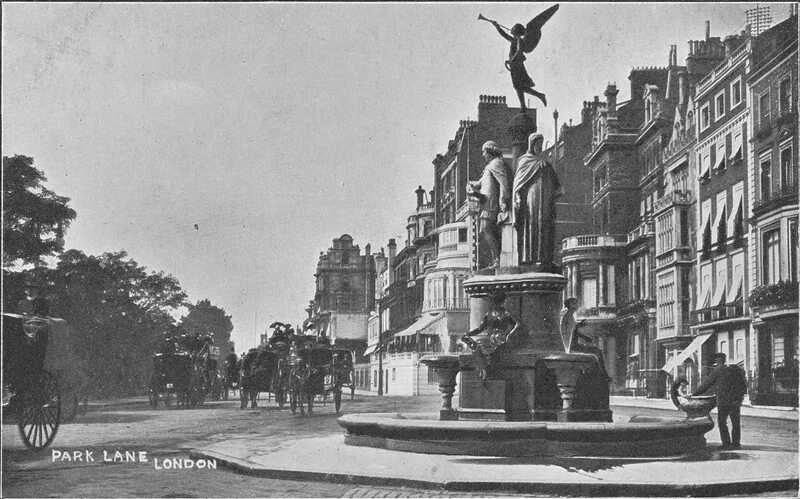 The Poets Memorial was built in the mid 1870s following a bequest by a Mrs M. Brown of Hertford Street, Mayfair. The memorial was designed by Thomas Thorneycroft and shows Geoffrey Chaucer, William Shakespeare and John Milton standing around the middle of the memorial. The memorial was demolished in the 1950s. 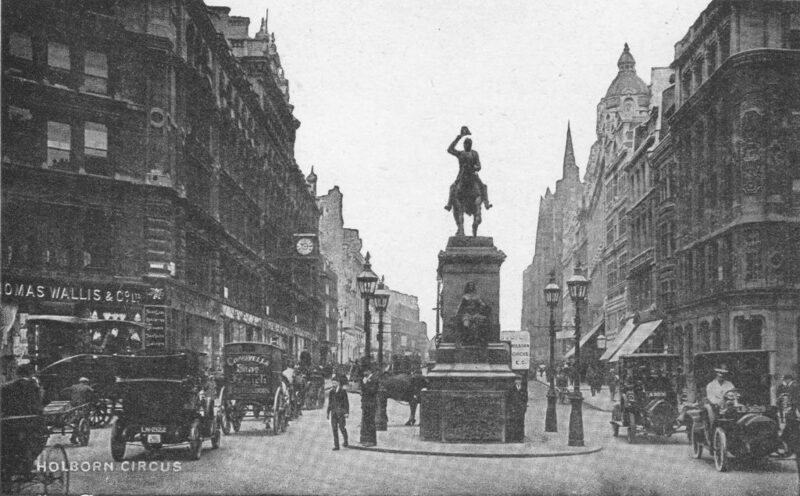 The following statue of Prince Albert at Holborn Circus is still in place, although the surroundings of the statue and the road traffic have changed considerably. 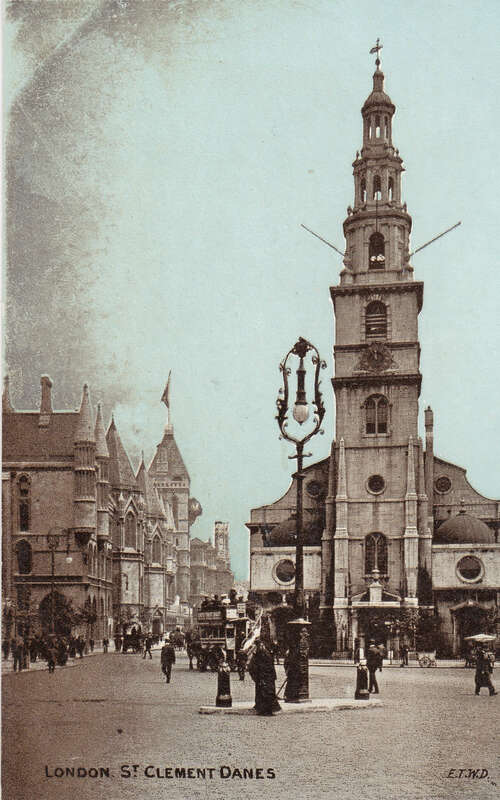 The following postcard shows the church of St. Lawrence Jewry in Gresham Street in the City, but what interested me is the rather ornate structure to the right side of the church. 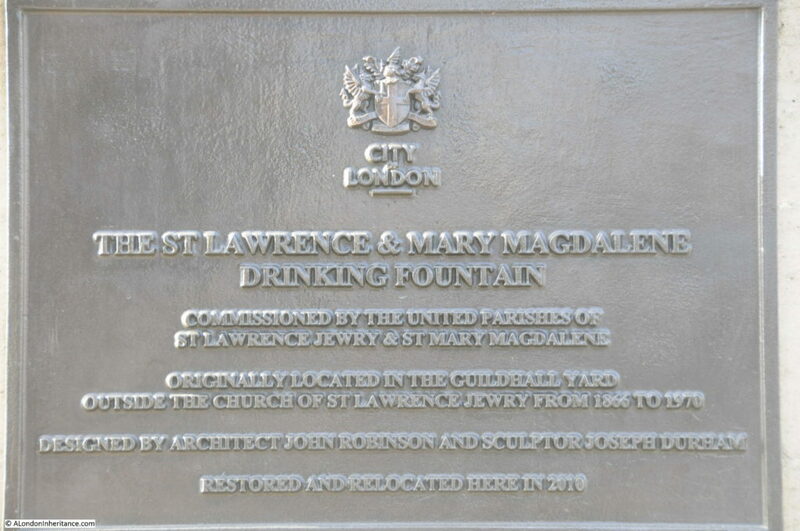 The structure was a drinking fountain installed in 1866 as a gift from the Metropolitan Drinking Fountain and Cattle Trough Association to the City of London. The street running in front of the church and fountain leads up to the Guildhall which at the time was a far more enclosed area than the large courtyard between the Guildhall and church that we see today. The creation of the large courtyard and redevelopment of the Guildhall was the reason for the removal of the drinking fountain in the 1970s. 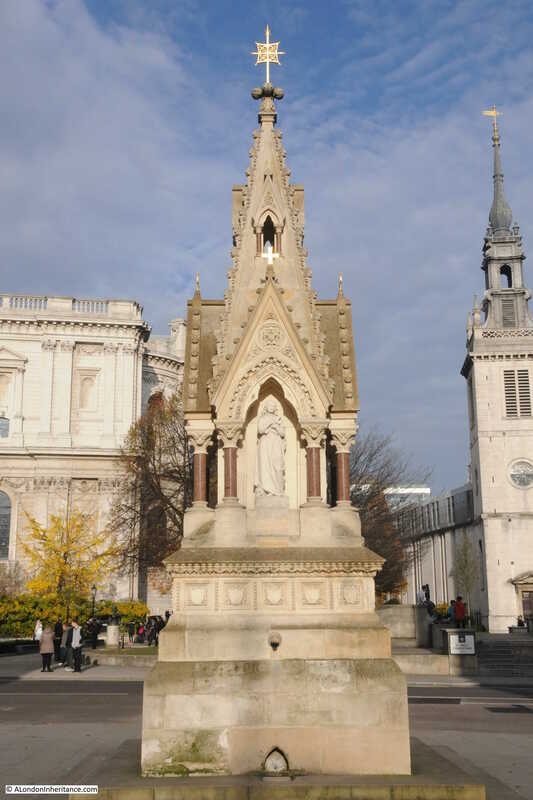 It was put in storage until a restoration project resulted in the installation of the fountain opposite the south side of St. Paul’s Cathedral in 2010. A plaque on the fountain records the original location and the restoration and move. The old photos of London shown on these postcards demonstrate how London has changed over the years, Frequently significant, in other places minor, but change is a constant for London. Many of these postcards were posted, to destinations within the UK and abroad, a reminder also that as well as comprising buildings, streets and monuments, London has always been a destination for travelers. I also agree with the comment sent to Martha in Gorleston on Sea that London is a good place to be “out all day long from morning till late at night”. This entry was posted in London Photography and tagged London Photography, London Postcards, Old London Photos on March 18, 2018 by admin.